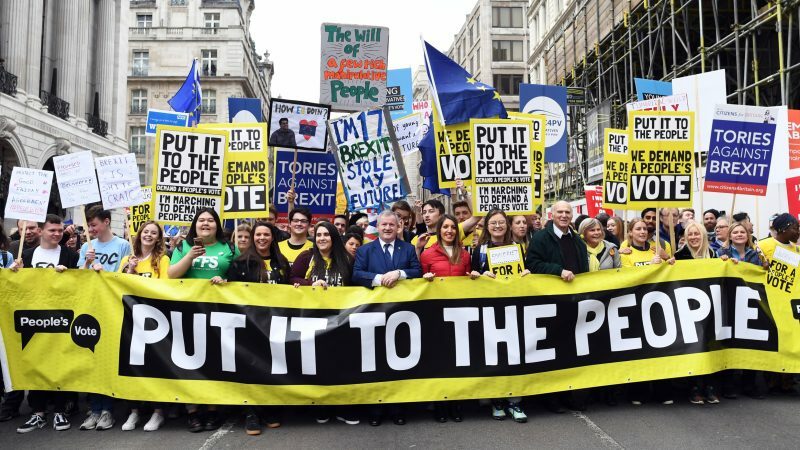 Hundreds of thousands of protesters swamped London on Saturday (23 March) demanding another referendum on EU membership amid political paralysis over Brexit, in one of the country’s biggest protests in decades. Thanks to all the wonderful people who have put energy and love into making this happen. “It’s terrible,” protester Emma Sword told AFP of the current political gridlock. Let the message ring out from the many thousands on the @peoplesvote_uk march. This is about our future, not our past. This is about uniting our country, not dividing us further. “We are now a Remain country. Nearly 90% of young voters who weren’t allowed to vote in 2016 would vote to remain,” he added. This week’s agreed delay to Brexit, which was set for 29 March, has prompted Prime Minister Theresa May to make a renewed bid to win MPs’ backing for her divorce deal. If she succeeds, Britain will depart on 22 May under the terms of the withdrawal agreement the prime minister struck with Brussels last year. But if lawmakers defeat the accord again, as expected, London must outline a new plan or face a no-deal Brexit as early as 12 April — unless it decides to request another extension and hold European Parliament elections in May. We from The Netherlands also joined the People’s Vote March in London last Saturday. What a magnificent demonstration of 1.000.000 people with pro-Europe sentiment!! And what a comparison with the 200 people at the Brexit march of Mr. Farage!